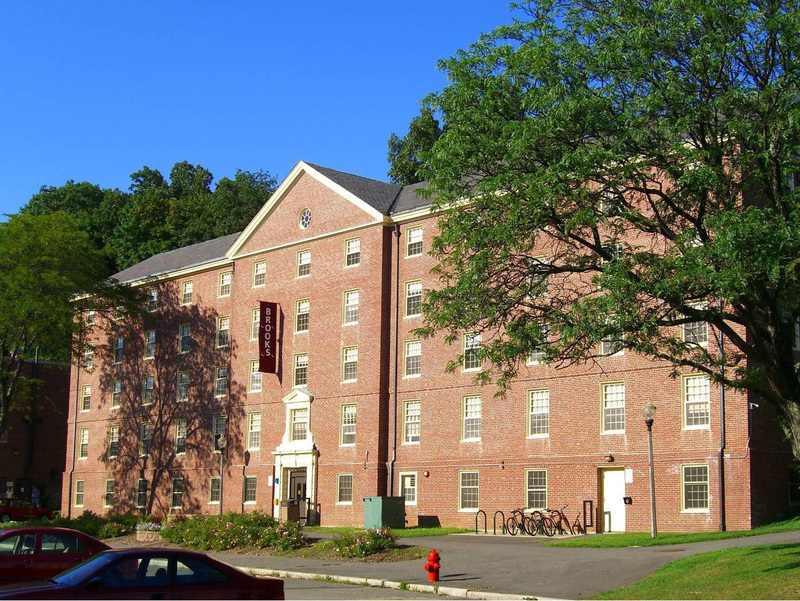 Brooks House is an approximately 37,000 square foot student residence hall on the Amherst campus of the University of Massachusetts. The building is one of nine structures that comprise the Central Residential Area. All nine buildings were designed and constructed between 1940 and 1963, and sited according to a Beaux-Arts formal plan. Brooks House was completed in 1949, one year following its mirror structure Mills House (New Africa) House. Although both buildings are designed in the Georgian Revival Style, Brooks House has a more simplified exterior design and most notably eliminated the mansard roof and dormers in favor of a full story and gable roof. The rectangular building is 5-stories tall and 13 bays wide by 3 bays deep. One central cross gable distinguishes the central 3 bays, which project slightly from the main building volume and visually divides the façade into three blocks. Similar to New Africa House, Brooks has a common-bond brick veneer with a molded brick projection to define the first floor level. The façade includes a window pattern of primarily double-hung sash. The first, third and fourth levels all have 8/12 sash, while the second floor is distinguished with larger 12/12. The fifth floor has 8/8 sash. Circular radial panel windows are located at the attic level of all four gable ends. Copper downspouts and collector heads are located at the north and south edges of the east and west facades. The building entrance occurs at the central bay of the west elevation and features a decorative wood doorcase framed by two pilasters and a rusticated surround. The woodwork continues to the floor above with a decorative window case with subtle swan’s neck jambs. The window head is surmounted by a wood pediment with copper flashing. The building site is located along the east side of Infirmary Way and accessed via a bituminous concrete vehicular drive. Infirmary Way is bordered by a wide bituminous concrete sidewalk. A concrete retaining wall holds back the grade change between the sidewalk and the entrance to the building and is accessed by a bituminous concrete path. Vegetation surrounding the building includes deciduous trees over mown lawn, evergreen trees, high deciduous shrubs, and low deciduous shrub foundation plantings. Site furnishings include bike racks and pole lights. An oblique aerial photograph from 1954 shows an open landscape to the east of Mills House (New Africa House) and Brooks House with lawn leading to the façades. This area has since been occupied by buildings, including Wheeler House and Brett Hall. The character of the landscape to the east of the buildings remains intact, with deciduous and evergreen trees over lawn. New low foundation planting has been added to the buildings since their construction and new formalized head-in parking has been added along Infirmary Way. Brooks House was named for professor William Penn Brooks (1863-1939). Two years after graduating from Massachusetts Agricultural College in 1875, William Penn Brooks accepted an invitation from the Japanese government — and his mentor, William Smith Clark — to help establish the Sapporo Agricultural School. Spending over a decade in Hokkaido, Brooks helped to introduce western scientific agricultural practices and the outlines of a program in agricultural education, and he built a solid foundation for the School. After his return to the states in 1888, he earned a doctorate at the University of Halle, Germany, and then accepted a position at his alma mater, becoming a leading figure at the Massachusetts Experiment Station until his retirement in 1921.